One of the most important pieces of furniture that we own is our bed frame. It is also one of the pieces that we may not think about too often. We spend around 33% of our lives asleep – and a good night’s sleep is essential to our overall health. A metal bed frame is one of the strongest and most durable of options. This type of frame is designed to last for many years to come, so if you can, invest in a good one and it will likely outlast your mattress! 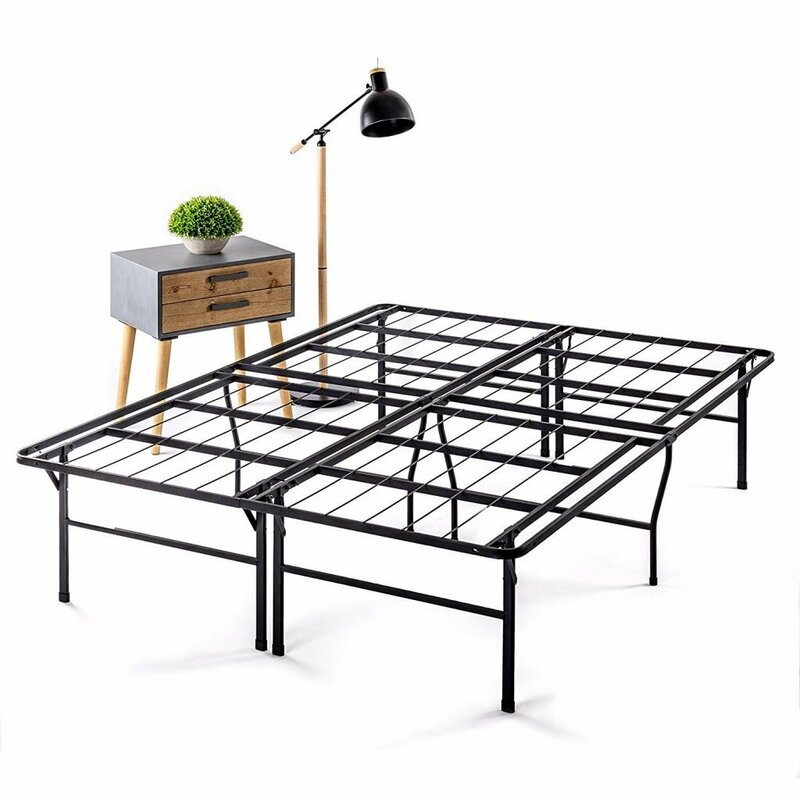 In this review for the best metal bed frame in the industry, we took the time to look at the most important features most consumers are after when buying this product. 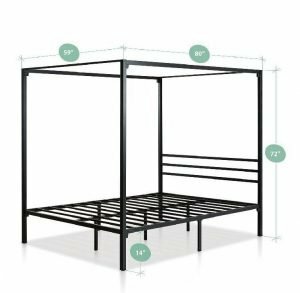 We researched the bed frame size, the maximum weight limit, the overall dimensions and the conditions of the warranty for the top-selling metal frames in the industry. Then, we put together a list of the best options out there, so that you don’t have to look all over town for the best frame for your buck. You can trust our ratings and research because we spent countless hours looking over real customer evaluations to find the very best products for you. We have looked over reputable feedback resources to ensure that you get the most precise information regarding the bed frames you may like to purchase. Then we took that information and placed it in the easy to read tables and product reviews listed below, allowing you to learn the reasons why you should buy each model. Be sure to read through our buying guide for an in-depth overview of the features you need to look out for when choosing the best metal bed frame. Lightweight, but ultra-sturdy, and incredibly easy to assemble – it’s not hard to see why customers rave about this model! 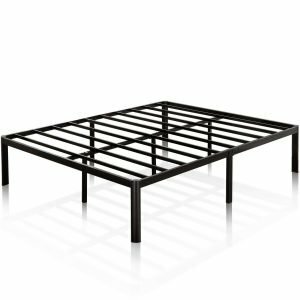 This high-quality metal bed frame is our top pick because it offers strong support and a variety of sizes. 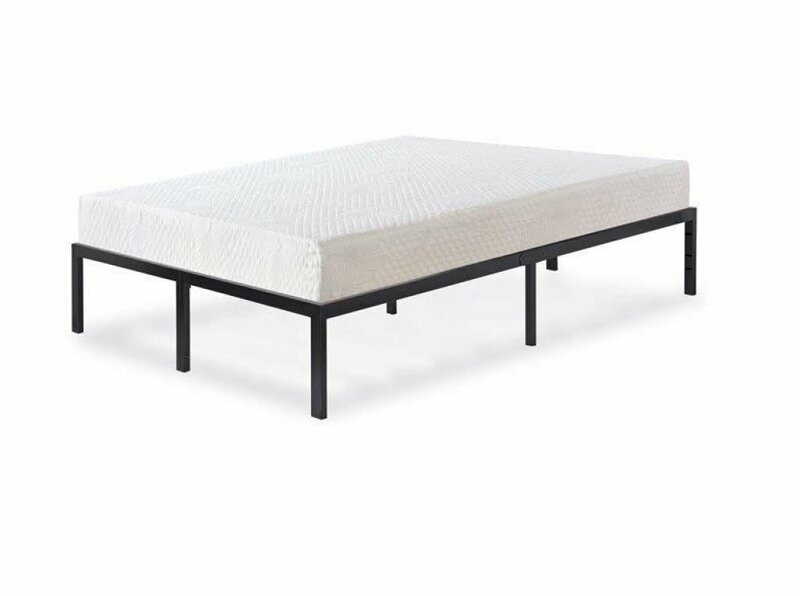 The Zinus Metal Platform features strong steel slats that eliminate sagging and increase the overall life of the mattress. Available in Twin, Full, Queen and King sizes, the strong metal slats help to prevent unwanted sagging while also increasing the lifespan of your mattress. This sturdy metal bed frame helps to eliminate the need for additional box springs. It is easy to assemble and offers 14” of clearance underneath for under-the-bed storage. The foam padded tape helps to keep the steel frame noise-free. And customers get a 5-year worry-free warranty from the brand. You can choose between a round corner or square corner bed frame. These frames are an affordable choice for anyone who needs a replacement bed, or an additional bed for their guest room or extra bedroom in their home. Simply set it up and place a mattress on top to instantly enjoy a pleasant night’s rest. You don’t have to buy a large and heavy bedframe that is expensive and difficult to move around just to create a functional room for family and friends who want to stay the night. 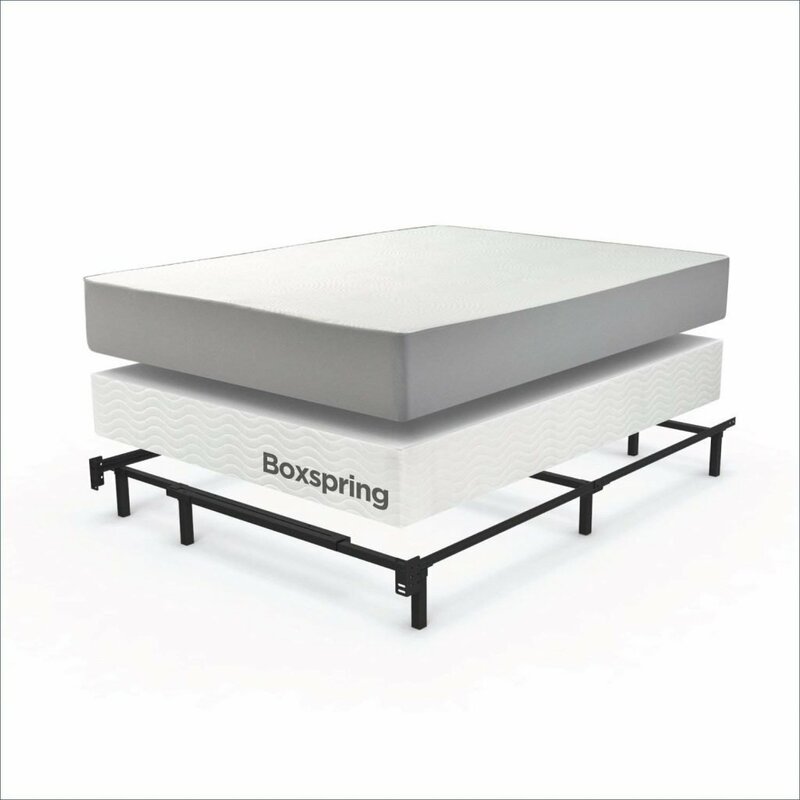 This model is just as comfortable as any frame and box spring combination, all at a fraction of the cost. 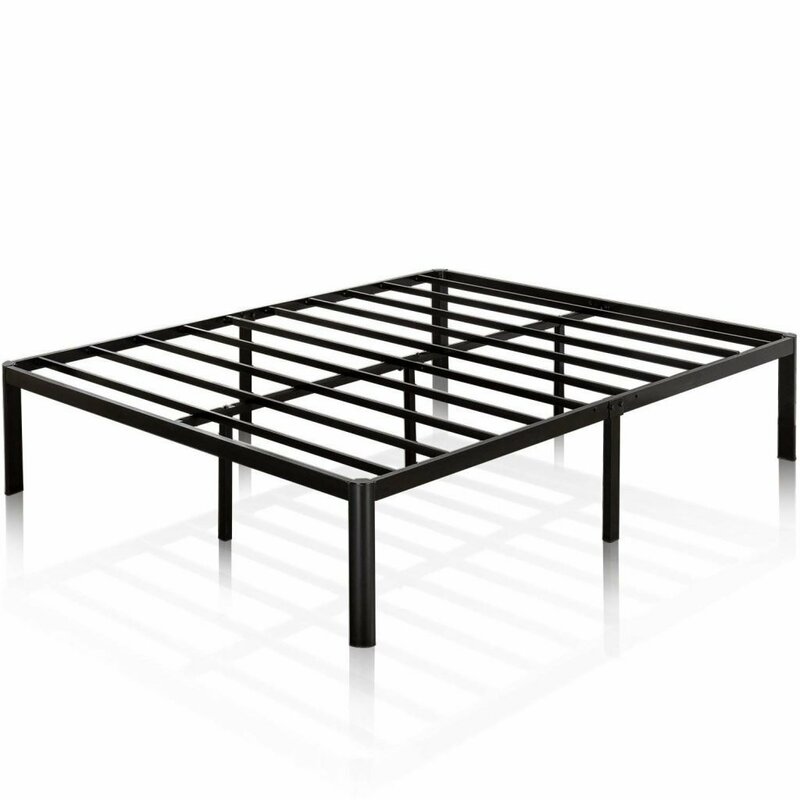 This Zinus Metal Platform Bed Frame measures 74.5 x 53.5 x 16 inches for the full-size frame and weighs just 36.6 lbs. This heavy-duty steel slat bed frame features non-slip support, for comfort all through the night. The frame is available to purchase in Twin, Full, Queen, and King sizes. It features a unique and sturdy design made from durable metal for long-lasting and secure support. The frame fully encloses your mattress to prevent it from slipping and sliding. This design also eliminates the need to add a box spring. Designed with modern bedroom furnishings in mind, this bed frame offers ample storage space underneath with an impressive 13.5-inch clearance. This will help you keep your bedroom organized and fewer items left in your way on the floor. 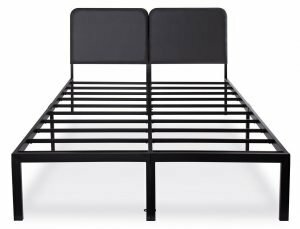 The Olee Sleep T-3000 bed frame offers a simple and easy assembly. All the required tools and hardware are included. 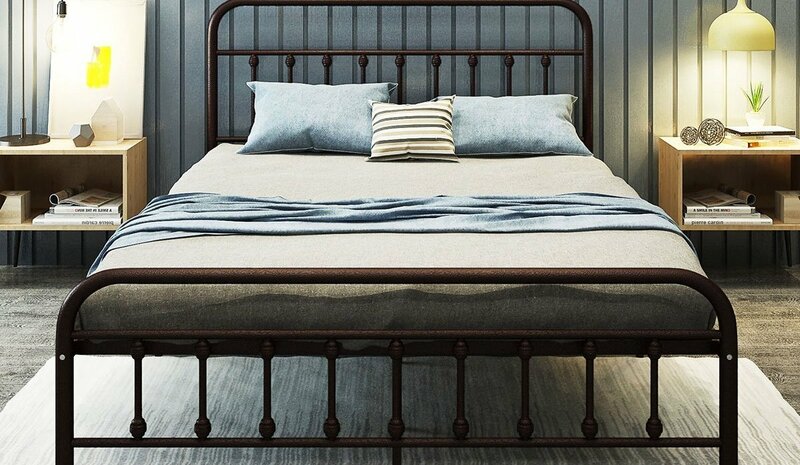 And this metal bed frame is also headboard compatible. It is an excellent bed frame to use when you want to replace your current mattress and box-spring setup. You can use this handy metal bed frame to create an instant bedroom in any area of your home. If you have a basement that you’d like to turn into a guest room, you don’t have to spend a small fortune on a large wooden bed frame just to provide your guests with a quality place to sleep at night. This bed frame will provide a comfortable and durable place to sleep either temporarily for guests, or every night for yourself. This metal bed frame comes with a 5-year limited warranty. It measures 81.5 x 77.5 x 15 inches and weighs 52.6 lbs. If you have ever dreamed of owning a poster bed or canopy bed, but didn’t want to pay out that much money just for a bed frame, this is the best option for you. This luxurious and sophisticated canopy four poster platform frame offers a quick and easy solution when you want a completely different look for your bedroom. 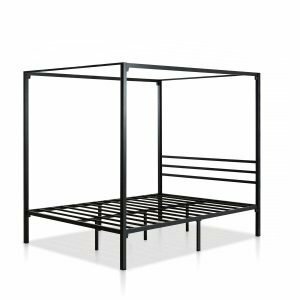 The four poster metal bed frame is available in either black or white. You can purchase it in Twin, Full, or Queen sizes. It features a conventional industrial style with a canopy top. The durable steel slats help eliminate mattress sagging, as it also improves your mattress’ lifespan. This bed frame allows for ample under-the-bed storage space with a 13” high clearance. This allows you to keep your bedroom organized and keep your belongings kept up and out of your way. This is a great way to use up the additional storage space in your room, all without worrying about large boxes becoming stuck under the bed. 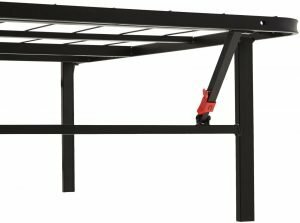 The bed frame is easy to assemble quickly and doesn’t require any additional tools or hardware to get it up and ready to use. You only need to add a quality mattress to the top to fully prepare the bed for a great night’s rest. There is also no need for box springs to be used, since the steel slats provide all the strength and durability that you need. The Zinus Four Poster Platform Bed Frame comes with a worry-free 5-year warranty. It measures 80 x 59.5 x 72 inches and weighs 85.3 lbs. This high-quality metal bed frame is another one of our top picks because it is available in so many different sizes. 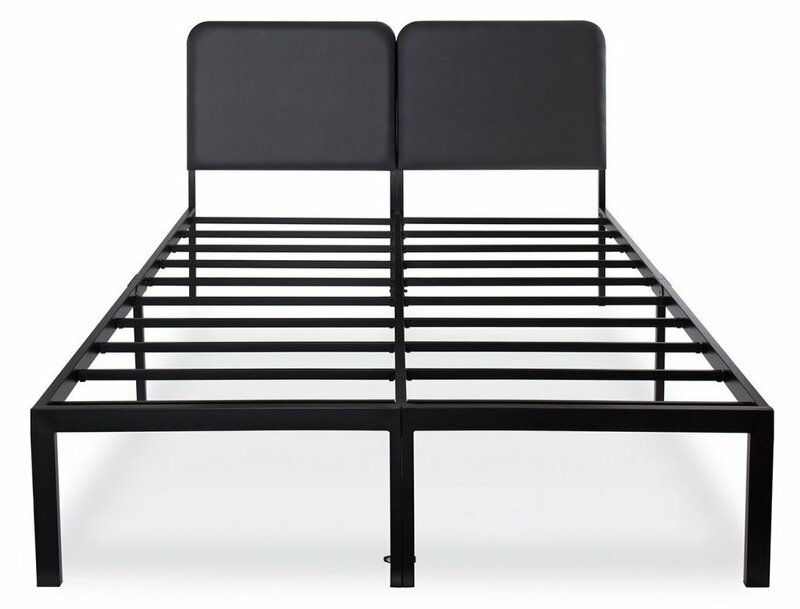 This Zinus bed frame has durable steel slats that prevent unwanted sagging and improve the lifespan of the mattress. 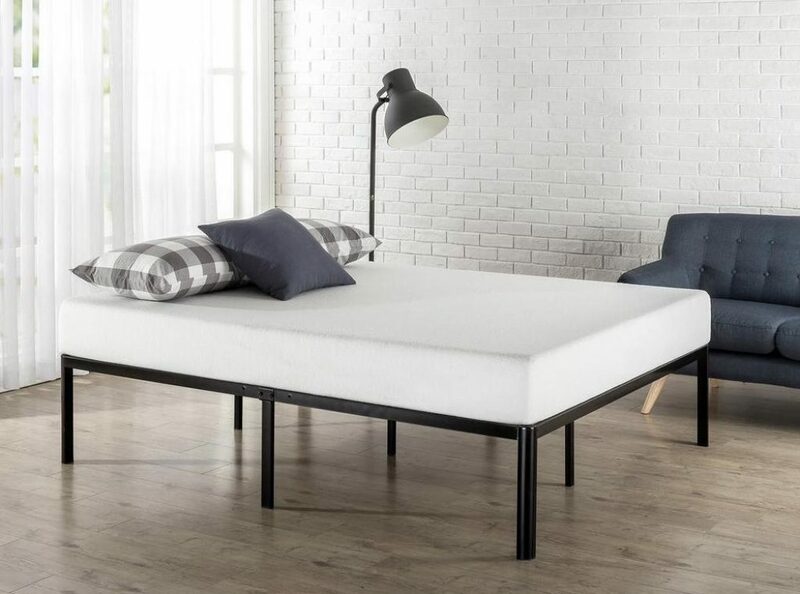 The bed frame is available in Twin, Full, Queen and King sizes, the convenient metal slats help to increase the lifespan of your mattress while keeping it fully supported without the use of a box spring, which can help save you money. It offers plenty of space for under-the-bed storage. The foam padded tape that is included helps to ensure that the steel frame remains noise-free. You also get a 5-year warranty from the manufacturer for extra peace of mind. These frames are an inexpensive choice for those who require a replacement bed or extra bed for their guests to sleep on. Just assemble it and put a mattress on top to enjoy a great night’s rest. The minimalistic design of this bed frame allows it to be folded away for easy storage, if needed. This also makes it easy to move around and set up, so whether you’re looking for a permanent, stationary bed, or a spare option for guests, this frame will fit the bill perfectly! 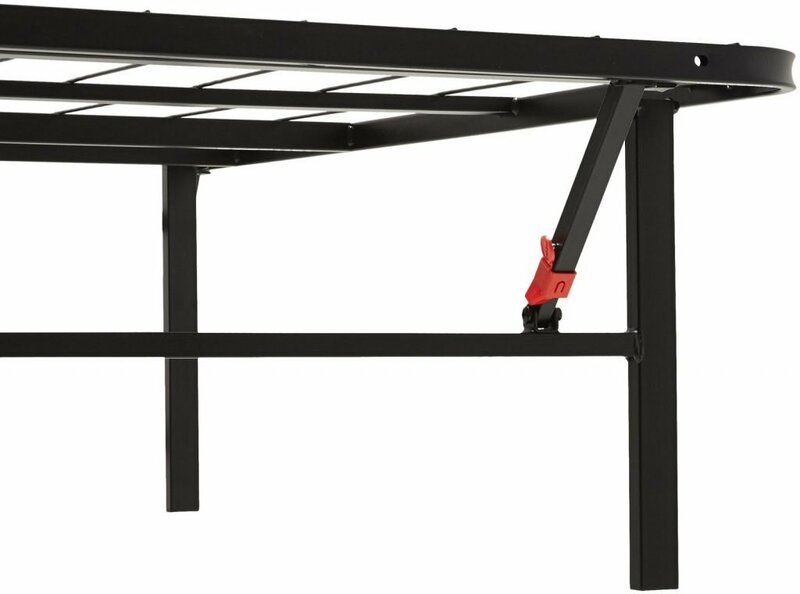 A durable metal bed frame need not break the bank, as the Zinus Compack proves. 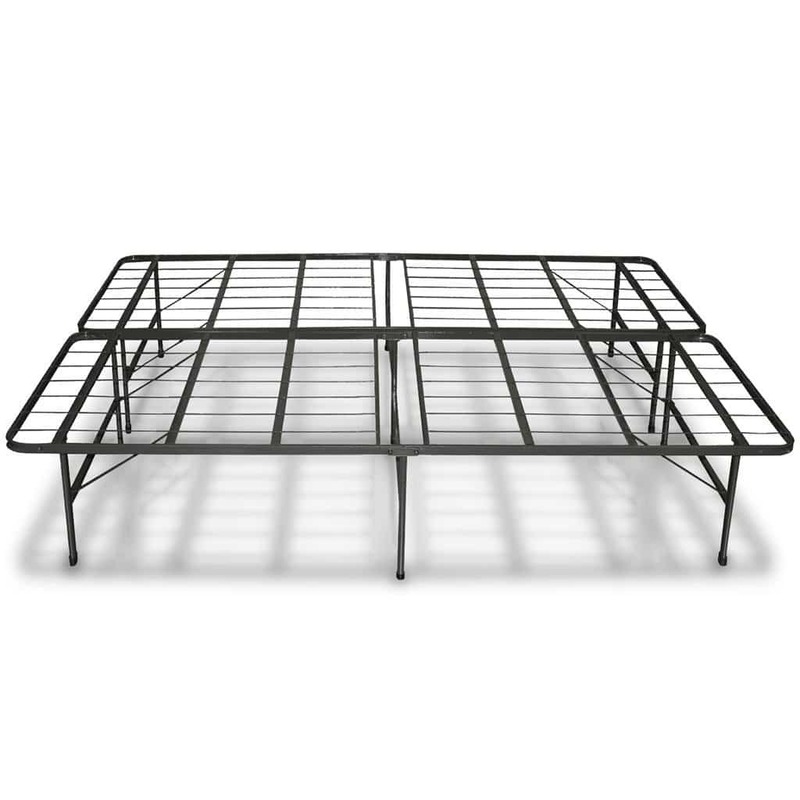 This metal bed frame is made from heavy duty steel material to provide you with a comfortable night’s sleep. 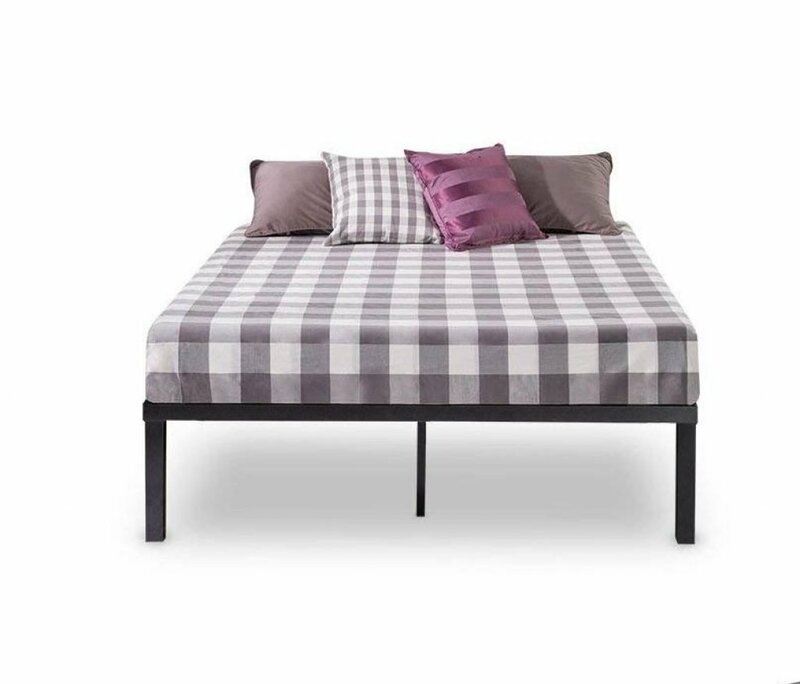 Available in Twin, Twin XL, Full, Queen, King, and California King sizes, this frame offers a convenient option when you want to add an extra bed to your home. 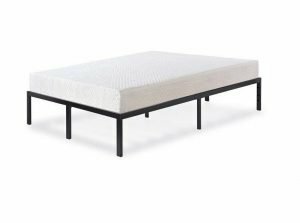 The full platform bed frame features a Smart Base mattress support system that doesn’t have any need for a traditional frame and box springs. You simply need to add a mattress to the top of the frame to enjoy a comfortable night’s sleep. 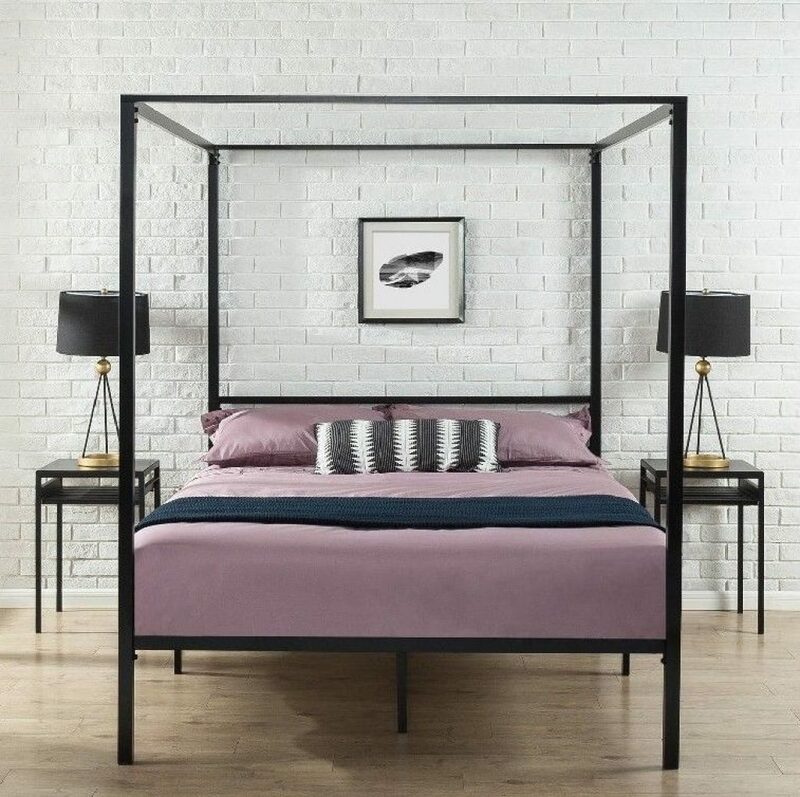 This bed frame features durable and noise-free construction and high-quality steel legs that have a concaved center leg design for added safety and support. The 17” under-the-bed clearance allows for plenty of added storage space so that you can keep all of your belongings in their place. Keep your room organized by storing out of season items under your bed or boxes of shoes until you are ready to wear them. The possibilities for under the bed storage with this metal frame are truly endless. This bed frame is easy to assemble and you can have it up and ready to use within a matter of minutes. All tools and hardware that are needed to assemble this bed frame are included. The frame is also foldable so that it can easily be put away in storage. 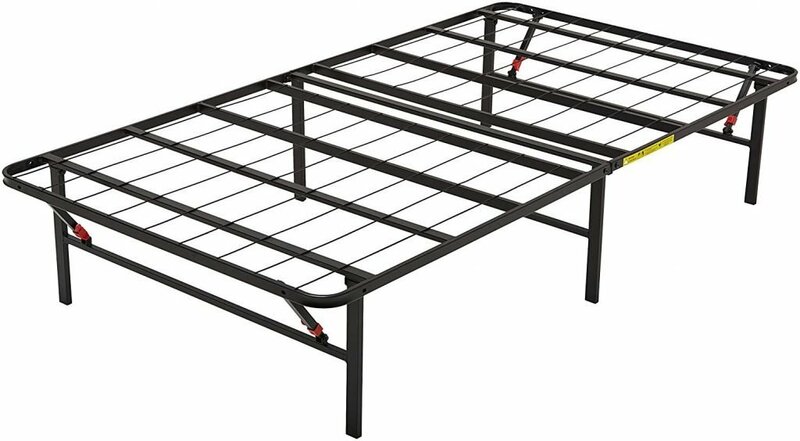 This metal bed frame comes with a 5-year manufacturer’s warranty. It measures 54 x 75 x 18 inches for a full size frame, and weighs 39.4lbs. 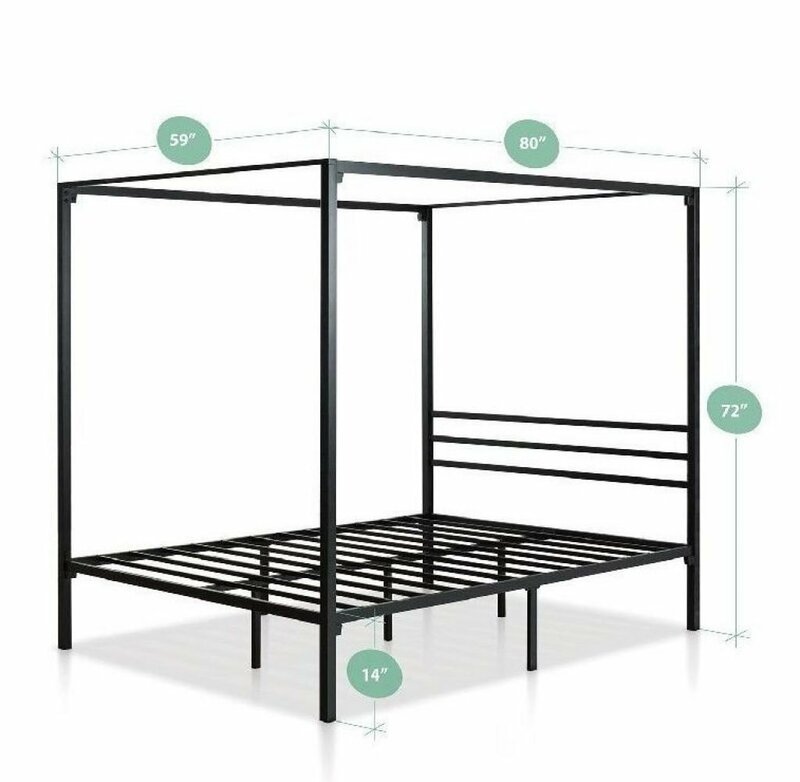 This platform metal bed frame is available to purchase in Twin, Twin X-Large, Full, Queen, King, and California King sizes. It is a very affordable option when you want to add another bed to your home. This bed frame offers quiet, noise-free sleep with a supportive foundation for any mattress. And there is no need to add a box spring ever. 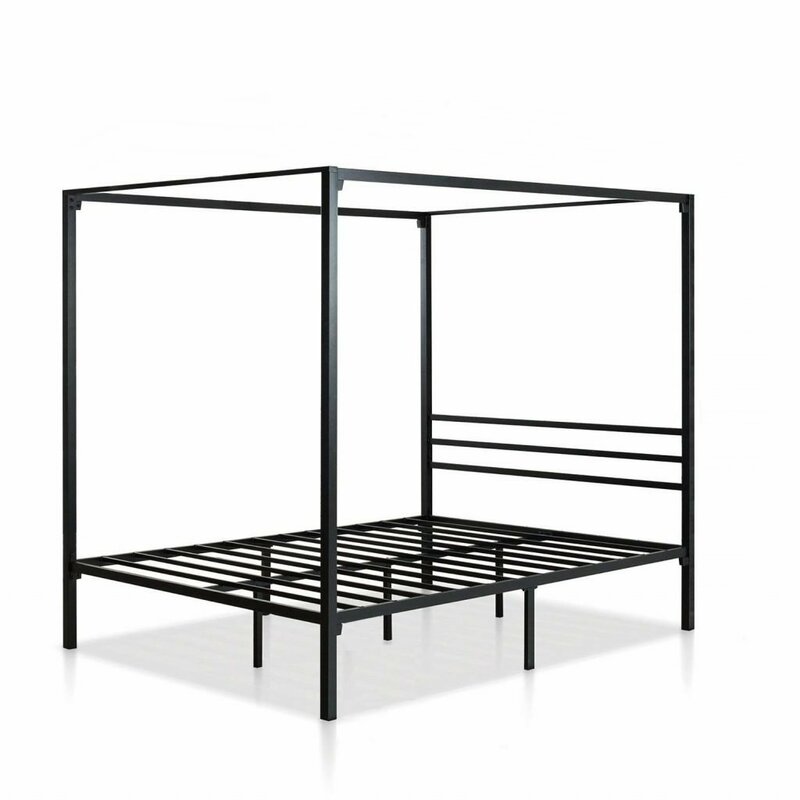 This metal bed frame is made of durable steel material with a luxurious black finish. It is designed for use by individuals up to 250 lbs., however there are several users who have claimed that it can withstand a much higher weight capacity. It provides you with the additional under-the-bed storage space that we can all use in our rooms. This under bed storage is essential for keeping your room organized and keeping all your items up and out of the way. The bed frame may accommodate a matching size mattress immediately following the fast and easy setup. And the best part is that there are no tools required. You have everything you need to set the frame up all on your own. Now when you have unexpected guests arrive at our home, or if you need to create a guest room for the holiday season, you can do that in an affordable and easy manner. 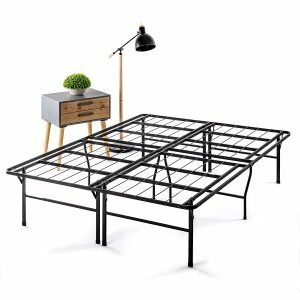 This durable metal bed frame from Amazon Basics is comfortable, durable and long lasting. It will be an excellent bed frame that is sure to provide you support for many years to come. And it will probably even outlast your brand new mattress. The Twin XL bed frame measures 80 by 39 by 14 inches and weighs 28.1 lbs. Metal bed frames like those mentioned in this guide can be a great benefit to consumers. They are strong and durable and also affordable, so you can add them to any spare room to instantly create a guest bedroom. If you are thinking about buying a new or additional bed frame for your home, take the time to study the most important features you need to consider to get the best bang for your buck. There are many advantages to having a top-quality metal bed frame. First, they are very easy to set up which means that you can have an extra bed ready for unexpected guests within minutes. Many of these metal bed frame models fold down for easy storage when they are not in use, so they do not require a lot of space. They are affordable, with most priced at or below $150, regardless of the size. And they are available in all standard bed frame sizes. 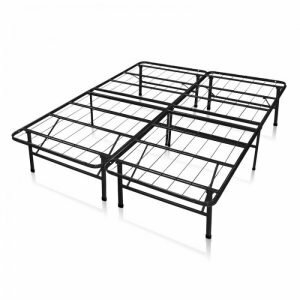 These bed frames are strong and durable enough or you to use them for your primary bed. But you can also have them on-hand for temporary use if needed. They are made from materials known for their strength and durability. And with these bed frames, there is no need to use a box spring for added support. There are several features to consider when it comes to choosing the best metal bed frame. Here are a few that you will want to look for while you are shopping around. 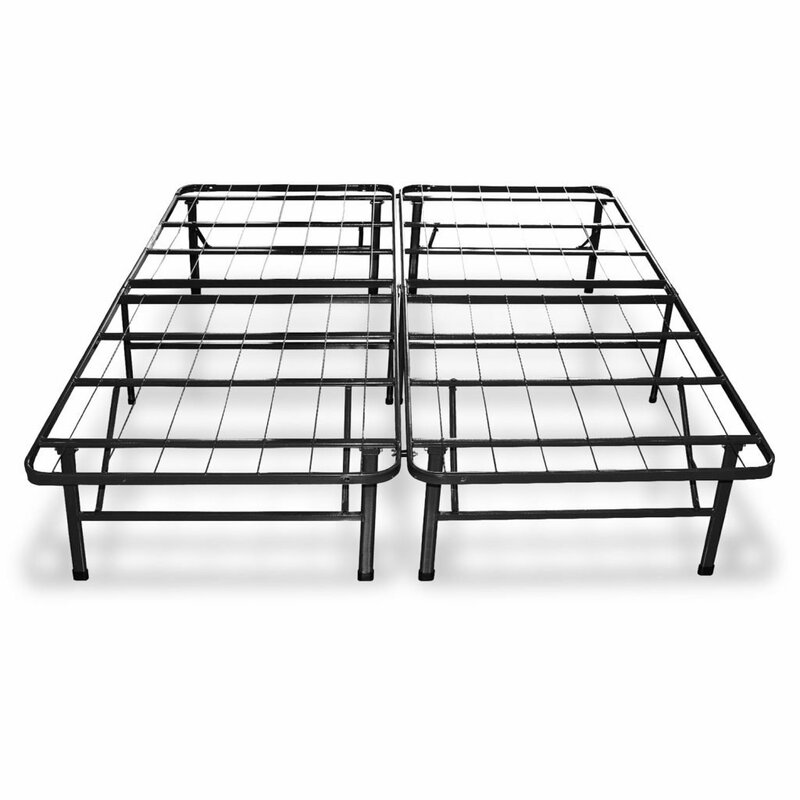 Metal bed frames are available in both traditional and non-traditional bed sizes. This gives you a lot of choice, so you can be sure the bed frame you need most likely comes in the size you require. Each metal bed frame will have its own weight capacity and the amount can range between 250-450 lbs. and more. While a 250 lb. weight capacity isn’t much, most users who own the quality bed frames with this weight limit have pointed out that the capacity is not very accurate and the frames can hold much more weight than described, an example being the AmazonBasics bed frame. 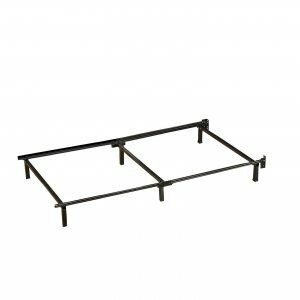 If you need a metal bed frame with a higher weight capacity, then you should check out the customer reviews and look for those that add in their high weight capacity as one of their best features. These frames are strong and sturdy enough to provide you with a secure night’s sleep for both you and your partner. 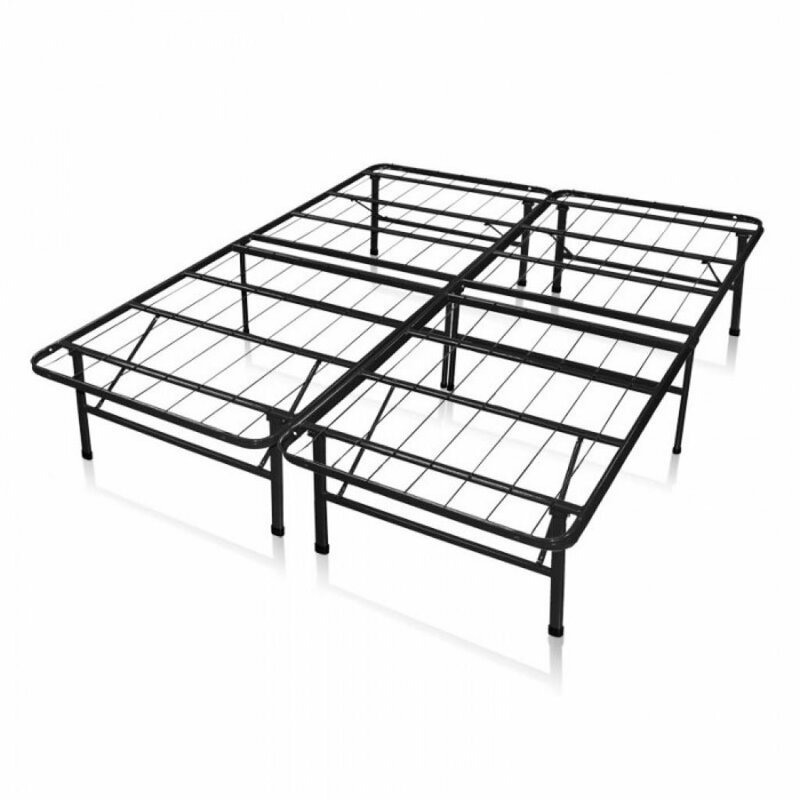 Metal bed frames are available in various sizes and dimensions depending upon what type you choose to buy. Examples of these bed frame dimensions are listed below. Make sure that you measure your mattress to check that it will fit comfortably on the bed frame you plan on choosing. 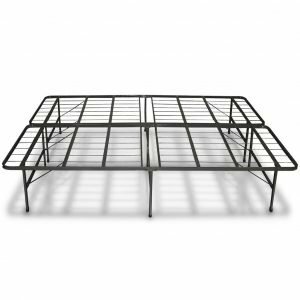 Metal bed frames are convenient because they are lightweight and easy to take in and out of storage. You won’t have much trouble carrying these frames from one location to another on your own. Most of the frames will weigh under 100lbs, with the average being around 60 lbs. This makes these bed frames an excellent choice for consumers who have friends and family members who stay the night often. Metal bed frames are not difficult to assemble at all. Most of the frames mentioned in this guide can be set up and ready to use within minutes of unpacking them. Check that the model you’re considering purchasing comes with all the hardware needed to effectively put the bed frame together with no additional tools needed. These bed frames also assemble very quickly so that you may remove one from storage and have it set up for your overnight guests in a matter of minutes. Attaching a headboard, if want something extra for your bedframe, is also super simple. The slats on metal bed frames are made from strong and durable steel material. 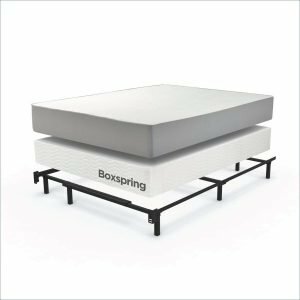 They are spaced out enough to support a mattress comfortably without the need of a box spring. The slats will also last throughout many years of use without wearing down. This makes the cost of setting up an additional bed in your home much more affordable because you only need to buy the metal bed frame and the mattress itself. No, that is one of the best things about owning a metal bed frame. These frames are designed to provide you with the comfort and support that you need, all without the use of a box spring. 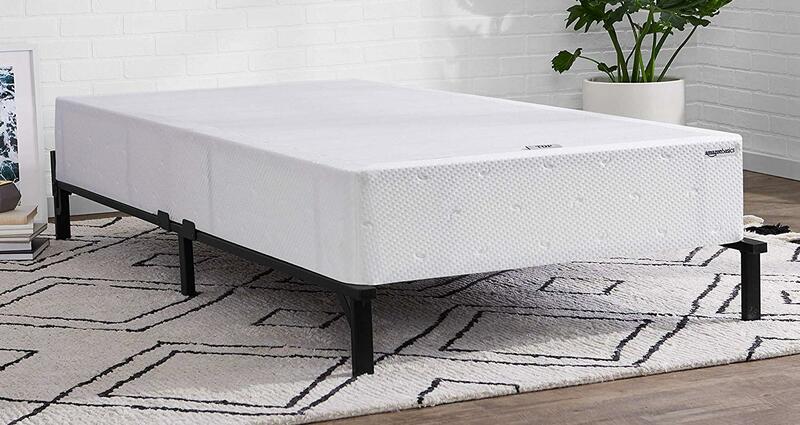 The solid steel slats on the frame provide you with all the flexibility you need to move around on your bed without ever missing the box spring. This is another great factor that makes metal bed frames some of the best frames on the market. These beds will often have a high under-bed-space clearance. This means that you can store boxes that are taller than normal underneath your bed and keep your bedroom organized. It’s as if you added a new bed to your room and got extra space to store all your things at the same time. Most metal bed frames come with either a limited or lifetime warranty from the manufacturer. These warranties are good for around 5 years on average. The warranty can provide protection against damage due to the manufacturer’s defects. Will I be able to add a headboard? Yes, most metal bed frames will have holes already pre-drilled in them to support a headboard. Or you could also use a stand-alone headboard if your metal bed frame does not have this option. How do I know if my mattress will fit inside the frame? To be sure that your mattress will fit inside your new metal bed frame, make sure that you find out what the inner frame dimensions are for the frame. This will let you know exactly what size mattress you need to use the frame with no box springs required. Can I replace the slats? 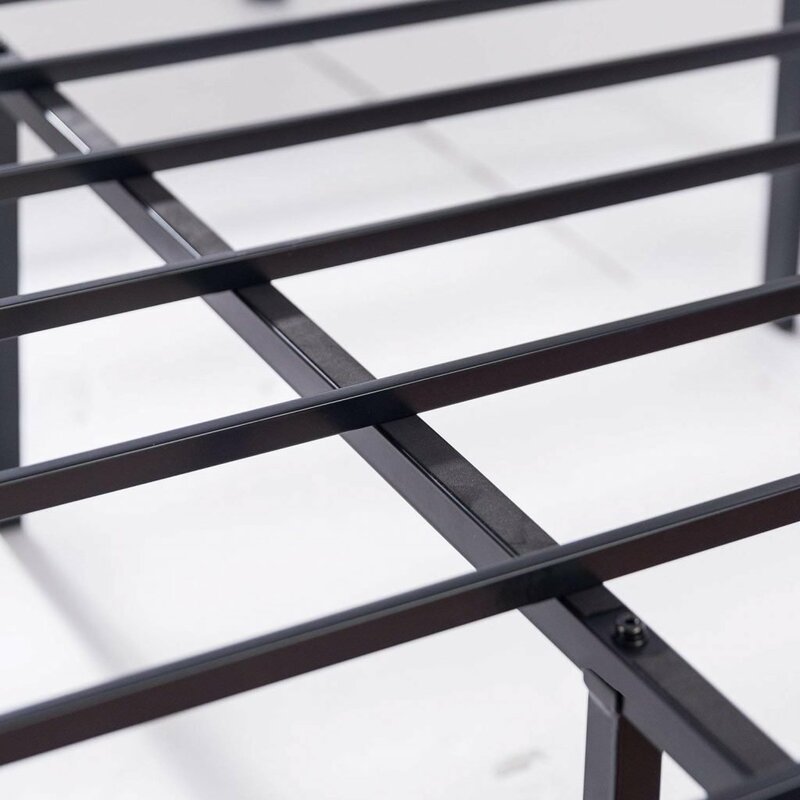 There are some metal bed frame manufacturers that do offer replacements for their slats, so that you can continue using your frame even after one or more of the slats become damaged. How do I stop my bed from squeaking? To stop your bed from squeaking, you should make sure that all parts on your metal bed frame are securely in place and there is nothing loose. The screws should all be tightened as well. You may want to oil the areas where the noise is coming from if possible which can also help eliminate noise. 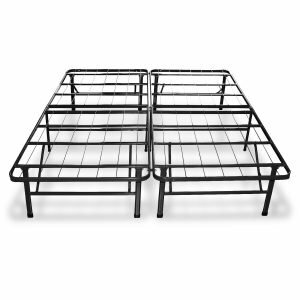 The metal bed frames that we have listed in this buyer’s guide are some of the best on the market. Our top 3 picks, the Zinus 16-Inch Metal Platform, the Olee Sleep T-3000, and the Zinus Four Poster Platform bed frame are all strong frames that are easy to assemble and will last for many years thanks to their amazing durability. Whether you are in the market for a standard metal bed frame, or would like to try something a little more elegant such as the Four Poster Platform Bed Frame from Zinus, you will be pleased with the features and durability of our top three picks. These metal bed frames are affordable, comfortable, and can help turn any room in your home into an instant bedroom, equipped for the best night’s sleep.